There’s been enough interest in this “design” from folks who’ve seen me wearing my new armwarmers around that I’ll be writing up the pattern. This should be a totally foolproof process as long as I can manage the color chart in an attractive computery way, so I hope to do it over the weekend. In case you want to go stash diving in anticipation (and this is a truly stash-divey project), these are knit with sport-weight or DK alpaca. I used Frog Tree’s (warning: before blocking this stuff was shaming me as a knitter–my stitches were cattywampus and totally ahoo at the needle joins, thanks to the 2-ply construction and loose gauge. Blocking solved everything, so don’t give up in despair as I would have if this hadn’t been such a spontaneous project.) and La Droguerie’s. I’ve got loads of both skeins leftover, so these long gloves don’t take much. Rowan Felted Tweed would make a delicious substitute; I’ll definitely be making myself a pair in some leftovers I’ve got on hand. Delicious rich brownness not captured here… the sun had already gone away again. The arm warmers look great! I can’t wait to make myself a pair. Coincidentally, I have a lot of leftover Felted Tweed in the stash! Both of those are beautiful! 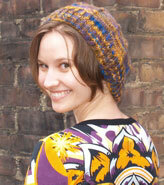 That Malabrigo yarn is gorgeous. 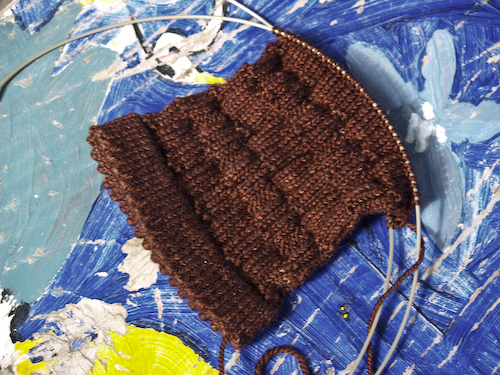 The Minaret gloves are EXACTLY the shade of warm brown I’m looking for to make a sweater…..best go off now and troll for some Malabrigo in worsted, eh? Both are beautiful. The alpaca looks really warm and luscious! I’m so glad you’re writing up the pattern! 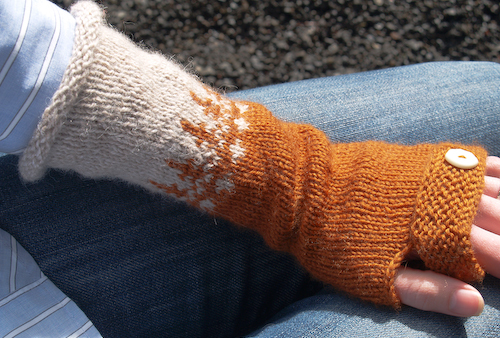 The mitts are just lovely. You knit that whole thing in your lunch break? Holy cow! Good job!